When Hasbro created the Crimson Shadow Guard set during the end of the Valor Vs. Venom era, I was pretty unimpressed. It was just six Crimson Guards decked out in black and carrying ninja weapons for reasons that were never adequately explained in the filecard. 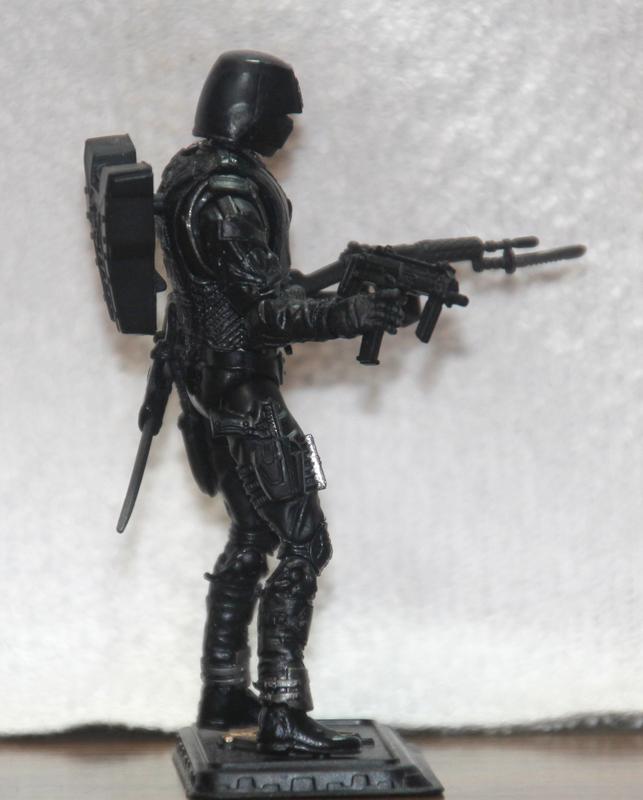 I wasn’t really clamoring to see this concept revisited (though I did eventually justify their existence as Cobra’s version of internal affairs), but Hasbro brought out the Cobra Shadow Guard in the 50th Anniversary line. Surprisingly, I couldn’t be happier. I’m not using him as a Shadow Guard, but in the intervening years, the Joe line introduced an idea I love—The Plauge. The concept was touched on in The Steel Brigade Vs. The Plague set and it was revealed that Cobra Commander decided to take a page from the US government’s playbook and took the best of his Cobras out of their respective ranks and put them together as a unit, like an evil version of the Joe team. It was fleshed out in the end of G.I. Joe: America’s Elite during the World War III storyline. Among the operatives we were introduced to was a Crimson Guard decked out in all black that went by the name Infrared. That’s who I see this as and as Infrared, he’s a lot more interesting to me. Infrared uses the same molds as the great Retaliation Crimson Guard. Yes, that means we just saw this entire figure recently, but considering how hard to find it was, I’m okay with it. I don’t mind when Hasbro re-releases hard-to-find figures like this. The lower legs come from 25th Anniversary Range Viper while the uppers are shared with 25th Anniversary Paine Brothers Snake Eyes. These parts work well together and give Infrared a more battle ready look. The torso is shared with the 25th Anniversary Crimson Guard, though you won’t see much of it because of the great vest that also came with the Retaliation Crimson Guard. This is a great piece and it works just as well for Infrared as is does for the Crimson Guard. The arms come from Pursuit of Cobra Shock Trooper and I like seeing these arms here as well. Up top, the head is shared with Retaliation Crimson Guard. I’m still not wild about the look of the head because the top of the helmet still looks too low to me, but it’s still a decent piece. Overall, the look works for Infrared and I prefer The Plague wearing black versions of their original uniforms rather than the matching black sweaters they had in America’s Elite. 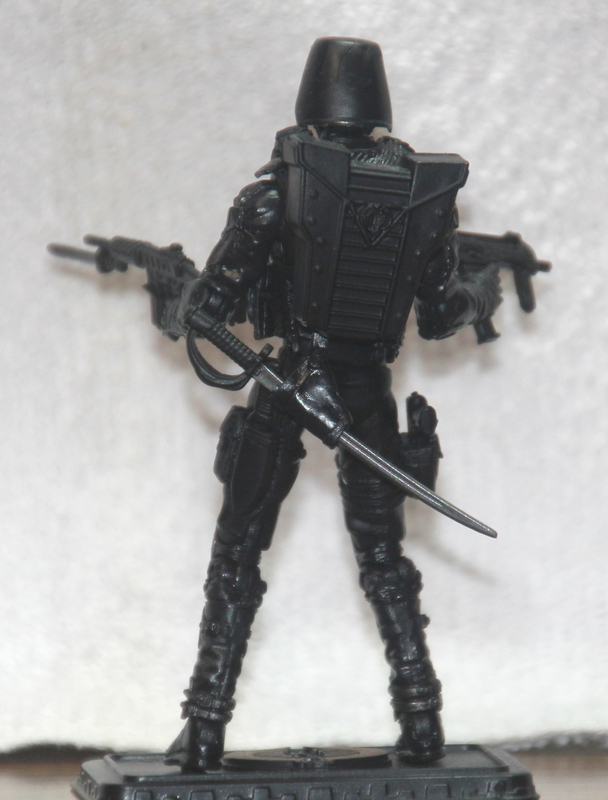 If a figure is going to be called Cobra Shadow Guard (and repurposed as Infrared), it’s pretty clear there’s going to be a lot of black used on that figure. Infrared is molded in all black plastic and the few details that get painted are painted silver. What little paint work is there is well done, but much like Snake Eyes figures, I feel a lot of good detailing gets lost in the sea of black. I think Hasbro could have made this figure a little more interesting by using a very dark gray on the vest and the shin armor and kneepads. It still would have made Infrared a very dark figure, but it would have made him a bit more visually interesting. The only other painted detail is a gold Cobra sigil on his chest to mark him as a part of the 50th Anniversary line. Infrared also shares most of his gear with the Retaliation Crimson Guard. That’s fine because that’s a well-equipped figure. Starting off small, he has a pistol to fill his leg holster. It’s a nice piece and I always like seeing holsters filled rather than left empty. On his back, Infrared is carrying a saber in his sheath. I’ll admit, I’m not wild about seeing this weapon again. The saber is decent, but I just don’t think it fits the character that well. Infrared has three different weapons options. Full disclosure, I forgot about the Rise of Cobra Crimson Neo-Viper rifle until well after I took down my photo studio, so I don’t have pictures of it. I don’t think that’s a real loss because that’s probably my least favorite weapon in his gear load. He doesn’t hold it very well and it’s kind of an awkward design anyway. I made the 25th Anniversary Crimson Guard rifle Infrared’s primary weapon. I liked this rifle back when it first came out in 2008 and it still looks good now, even if its bayonet did get bent in the package. Infrared’s other weapon is the great submachine gun that first came with Rise of Cobra Paris Pursuit Baroness. It’s a nice compact weapon that I can see being very effective in laying down cover fire for the rest of The Plague. Rounding out the gear, Infrared also gets the same great updated Crimson Guard backpack we got with Retaliation Crimson Guard. It’s a good piece and I like seeing the ties back to the Crimson Guard on their representative in The Plague. 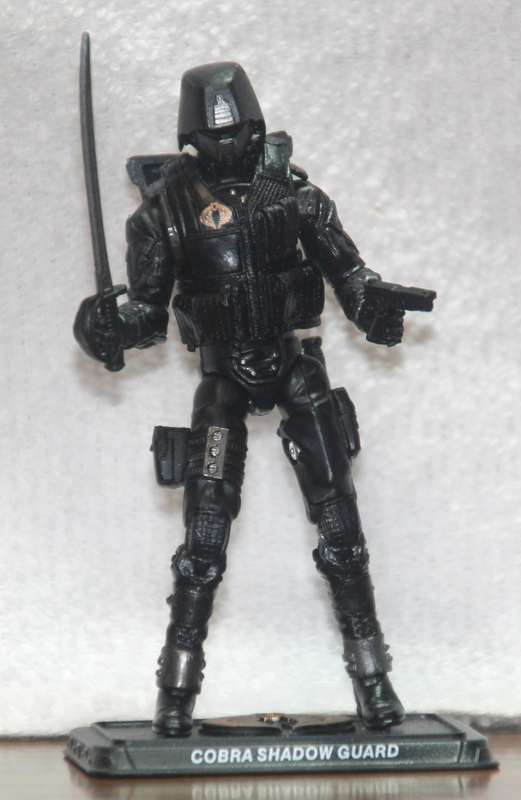 If it were possible to army build the Marine Devastation set, I’d be okay with having a squad of Cobra Shadow Guards, however, since I’ve only ever seen one at Toys ‘R’ Us, I decided to use him as Infrared. I don’t know why, but when The Plague was first introduced in the Steel Brigades Vs. The Plauge set, my brain really latched onto it and then fleshing them out a little more in DDP’s last Joe arc made me love the idea even more. I still prefer the original styling of taking the Cobra uniforms and turning them black over the commando sweaters, but DDP still did some pretty cool things with them. 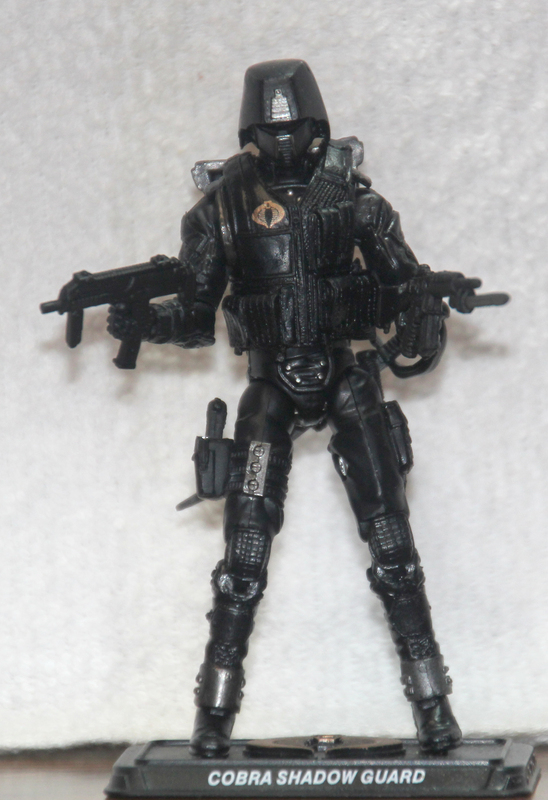 Infrared is a solid figure, I just wish there were some way to get more members of The Plague from Hasbro on the GIJCC.